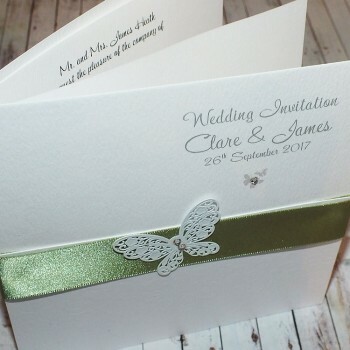 All prices for individual wedding invitations for day and evening, wedding day, order of service, menu, place cards and thank you cards are shown on-line. However, all designs are flexible and can be made to suit different sizes of card and different budgets. 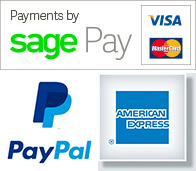 For example, you may add or remove crystals or ribbons according to your budget. All prices include inserts and envelopes where applicable and a free proof for most items. Proofs must be signed and returned before work begins on your invitations. If your order is urgent, please contact me to discuss whether it is possible, as we can sometimes offer an express service. There is no extra charge for this. In this case, the proof may be provided as a .pdf file via e-mail. A guide to prices for individual items is shown below. Unlike other Wedding Stationary suppliers we have NO minimum orders. Prices are subject to change and may be altered at any time. Place cards £1 Blank, £1.15 Personalised with your names and the wedding date, £1.35 Personalised with your names, the wedding date and your guests' names. We can print your guests' names on the invite inserts for an additional fee of 15p per invite. Most designs can be tailored to your budget by adding or removing ribbons, crystals etc. Please contact us if you wish to discuss your options.